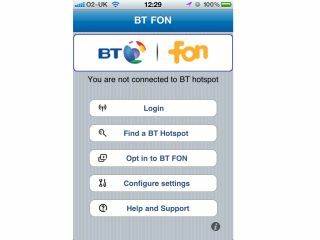 BT has announced a new BT FON smartphone app that it hopes will help customers find and connect to its network of Wi-Fi hotspots more quickly. BT's Openzone and BT FON Wi-Fi network in the UK's largest and the telecommunications giant is keen to prove that by making them more accessible to its customers. To that end, BT's app has been released for iPhone and Android to help BT Total Broadband customers. "BT today announced a new free mobile application that will automatically connect customers to its network of 1.6 million Wi-Fi hotspots, giving them an even easier way to connect to the internet when they are on the move," said BT's release. "The free iPhone and Android application gives BT Total Broadband customers easy mobile access to free and unlimited Wi-Fi and includes a mapping service which is updated weekly so that customers can find their nearest hotspot. "Once BT customers have downloaded the app, all they need to do is input their btinternet email username and password, and choose to be automatically logged in whenever they are in a BT Wi-Fi area. "The access is unlimited and free for BT Total Broadband customers, so there's no chance of racking up extra costs on your mobile phone bill." You can download the apps from the normal app stores for each mobile OS, and BT is also contributing 50p to Children in Need for every BT FON app download, capped at £10,000 - which should be applauded.